What is the optimal group size for decision-making? Much of work today is done in teams. Even in MBA programs, the team is the structure used to meet class goals. So what is the optimal size for effective decision-making? It appears that a recent Harvard Business Review stat published that research by Marcia W. Blenko, Michael C. Mankins, and Paul Rogers indicates that seven (7) is the optimal size. Yet much of the research I’ve found says that number is a bit too high. This (an odd number) prevents ties and improves the odds of making a correct decision when using majority rules. Even-numbered groups can make decisions, but the decision-making can take more time. This “c factor” (the group’s collective intelligence) is not strongly correlated with the average or maximum individual intelligence of group members but is correlated with the average social sensitivity of group members, the equality in distribution of conversational turn-taking, and the proportion of females in the group. So it looks like social sensitivity–possibly a more common attribute to females–facilitates group decision-making. Emotional intelligence and what some consider the soft stuff is important to the functioning of teams. So getting back to the optimal group size–what’s the best number? In what size, can you have the equality in distribution of conversation turn-taking as the research indicates is an important feature of an effective group? As can be seen by the figure below, the number of possible social interactions begins to explode in groups with more than 5 people. 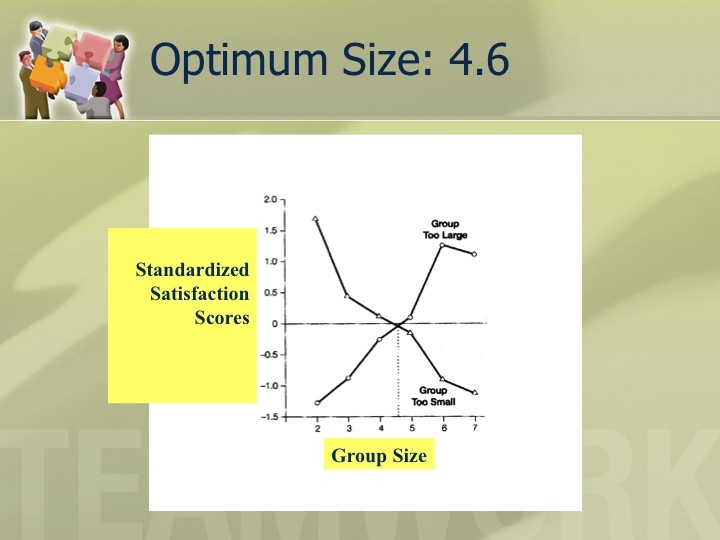 Research by Hackman and Vidmar (1970) on optimum group size for member satisfaction showed a similar outcome. They composed groups that ranged in size from 2-7 members to assess the impact of size on group process and performance for various kinds of tasks. After the groups had finished their work, they asked participants independently to indicate the extent of their agreement with the following two questions: Question #1- This group was too small for best results on the task it was trying to do. Question #2- This group was too large for best results on the task it was trying to do. The chart below indicates the average answers to these two questions on the same graph. Not surprisingly, few people in the dyad thought it was too large and few in the 7-person group thought it was too small. What is noteworthy is where the two lines crossed. They dropped a perpendicular line from that point to the horizontal axis and discovered that the optimum group size was 4.6 members. So if you’re looking for the best size for a team, consider an odd number close to five. But remember the number is just one factor. Social sensitivity and being able to read emotions are attributes of successful team decision making. Consider the number and consider the members. Maybe they’ll need a little training in empathy and being sensitive to others as well as having a culture that allows all to fully participate. Sounds like the right-sized team that practices many of the principles of employee engagement can be the most effective. Interestingly enough Anita Woolley in her research also mentions that collective intelligence grows as a team size increases and it flattens out between 10 and 11 people. It means that from a perspective of solving complex problems or accomplishing complex tasks the additional power we get by adding further team members compensates for the cost of more communication path and social interactions. It goes way beyond 5 people. I often ask people during my presentations about an opinion whether individual intelligence and collective intelligence are connected. I always get vast majority of answers pointing that there is such connection, a discussion is only how strong it is. As you surely know the research didn’t prove it to be true. This is, by the way, a challenge of research based on opinions–the conclusions should be drawn very carefully. By the way an interesting area to focus on would be what happens in big teams, e.g. bigger than 10 people. From my experience the team dynamics changes a lot. People tend to create sub-groups but often these sub-groups are created and disbanded dynamically depending on a situation. This at least partially addresses the challenge of too many social interactions and communication complexity. In other words at the same time a person can operate in a small group and a bigger entity. What would be the team size exactly in such a case? Pingback: What's the Optimal Team Size for Workplace Productivity? The size of the group is not the only problem. Another problem, for example, may be what is the optimal kind of experts that are to be engaged in a particular task. Depending on what experts one chooses in the decision making process they may twist or distort the decision in one direction or another. If you can manipulate, however the decision by the choice of the types of experts, what is the idea to letting them making the decision – why don’t you take personally the decision? … and it is not funny. Employee Engagement Index–how to compute it?